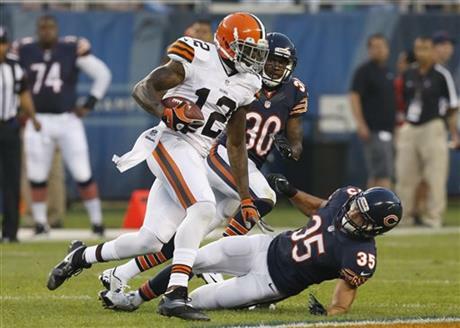 The Cleveland Browns close out the home portion of the 2013 NFL season on Sunday when they host the Chicago Bears, a team the Browns have beaten four consecutive times at home. A win would give the Browns four home victories this season. That may not sound impressive, but it would mark the first time the team has recorded at least four home wins in consecutive seasons since returning to the NFL in 1999. The Bears are in a fight for a playoff spot in the NFC North and will start Jay Cutler, who has only played once since the end of October due to injury, at quarterback. The Browns will counter with Jason Campbell and his 1-4 record as the starting quarterback. The Browns may actually be catching a break with Chicago coach Marc Trestman’s decision to bring Cutler back to the lineup because Josh McCown has been putting up big numbers in Cutler’s absence. In seven games this year, McCown has posted a passer rating of 109.8, has thrown for more than 340 yards and at least two touchdowns in his past three starts, and the Bears are averaging 2.65 points per drive with McCown at quarterback – only Denver at 2.91 is more productive. It is an interesting move by Trestman and one that the Browns will gladly take. No matter who the quarterback is for the Bears, the Browns defense will face a tough test in Chicago wide receivers Brandon Marshall and Alshon Jeffery. As this article at Grantland points out, no team is seeing fewer pass attempts to No. 1 wide receivers than the Browns and corner back Joe Haden. But even if Haden wins the battle with Marshall, or at least holds him to a draw, the Browns could be in trouble with Jeffery. As good as Haden has been covering the No. 1 wide receiver, that’s how poorly the Browns have been against opposing No. 2 receivers. The Browns are 20th in DVOA against those second options (the quarterback sees you, Buster Skrine) and Jeffery comes into Sunday’s game with 17 receptions for 333 yards and three touchdowns in his last three games. “This team is a lot like Detroit in that they have weapons at every position,” Browns defensive coordinator Ray Horton told the team’s website. “Brandon Marshall and Alshon Jeffery have the most catches in the league. I think they have the most combined yards in the league, and they are both, in our minds, No. 1 receivers. Offensively, it’s going to be up to Campbell to try and keep pace with the Bears. Even though the Browns lost last week to New England, Campbell had his best game of the season in throwing for 391 yards and three touchdowns. More importantly, he didn’t throw an interception for the second consecutive game and for the fourth time in his five starts. The Bears present an interesting opportunity as they come into the game last in the NFL in rushing defense, allowing 157 yards per game, last in yards per carry at 5.2, last in runs off more than 20 yards with 16 and 29th in the league in rushing touchdowns allowed with 16. Of course, the Browns rushing attack is nothing more than a rumor, as they are 28th in yards per game (84.3), 25th in yards per carry (3.8), 19th in runs of more than 20 yards (seven) and last in rushing touchdowns (two). We would like to say that having “leading rusher” Willis McGahee out this week with an injury hurts the team, but the truth is it really doesn’t matter. The Browns will once again turn to a backfield by committee of Chris Ogbonnaya, Fozzy Whittaker and the newly signed Edwin Baker. The Bears tied an NFL record last week by allowing a running back to exceed 100 yards in a game for the sixth consecutive week. The Browns can’t even get 100 yards combined from their running backs, so it looks like that streak will come to an end. The game plan, as always, should be to get the ball to Josh Gordon and Jordan Cameron and hope for the best. According to Pro Football Focus, Chicago safeties Chris Conte and Major Wright have a combined pass coverage grade of -15.4, which means there could be plenty of openings for Gordon and Cameron. The Browns come into the game having lost seven of their past eight games as they play out the string on another lost season. But they have lost the past two games by a combined five points, which shows the team hasn’t quit on the season but rather have just consistently found ways to lose games. The Bears present a tough challenge, especially if they hit their season average of 28 points – a point total the Browns have only surpassed three times all season. We want to like the Browns in this game, but we have a feeling the Bears are going to find a way to pull this one out. Thomas , how is it remotely possible the Browns are 9-5 lifetime vs. the Bears? The Browns and the Bears were in separate divisions in the pre-merger NFL so they didn’t play as often as you would think.